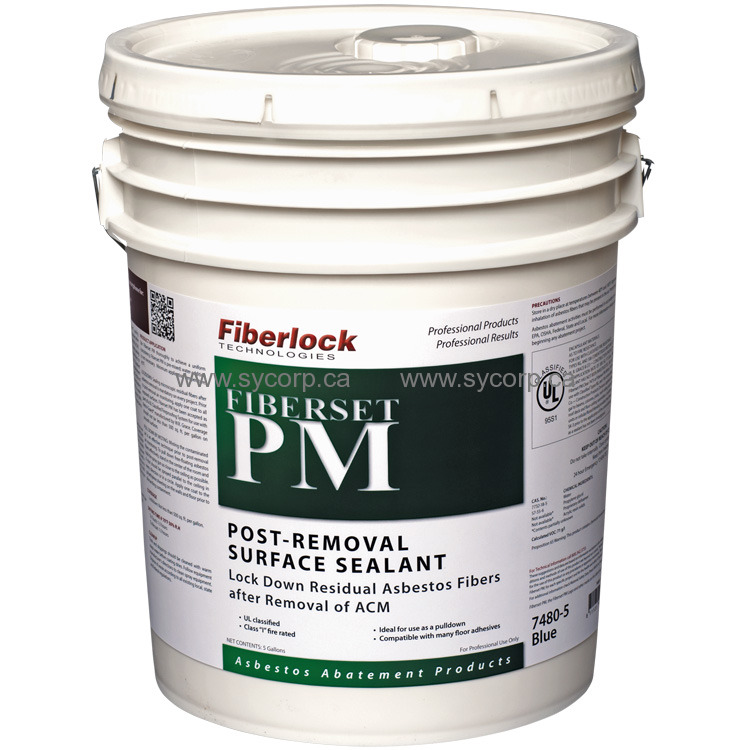 Fiberset PM is a pre-mixed “lockdown” sealing treatment for microscopic residual asbestos fibers present after the removal of Asbestos Containing Material (ACM). Fiberset PM is a ready-to-use, Class “A” fire-rated coating that provides a flexible barrier over residual asbestos fibers to ensure final air clearance. Fiberset PM is UL® classified for use as a primer for fireproofing replacement materials under the “Encapsulant Materials” section of the UL directory, and is compatible with most leading brands of flooring adhesives. Fiberset PM is a water-based coating that employs advanced 100% acrylic resin technology to extend the life expectancy of airless spray equipment. After asbestos is removed, spray Fiberset PM Lockdown on the newly exposed beam or deck assembly. One coat of this premixed lockdown traps all microscopic asbestos fibers left on the surface and ensures final air clearance. Warning! If you scrape, sand, or remove old paint from any surface, you may release lead dust. LEAD IS TOXIC. EXPOSURE TO LEAD DUST CAN CAUSE SERIOUS ILLNESS, SUCH AS BRAIN DAMAGE, ESPECIALLY IN CHILDREN. PREGNANT WOMEN SHOULD ALSO AVOID EXPOSURE. Wear a NIOSH approved respirator to control lead exposure. Carefully clean up with a wet mop or HEPA vacuum. LOCKDOWN - Sealing microscopic residual fibers after asbestos removal is mandatory on every project. Prior to post-removal air monitoring, apply one coat to all exposed surfaces. Fiberset PM has been accepted as part of a UL Classified Fireproofing System for use with Retro-Guard® manufactured by W.R. Grace. Coverage should not be less than 500 sq. ft. per gallon on smooth surfaces.